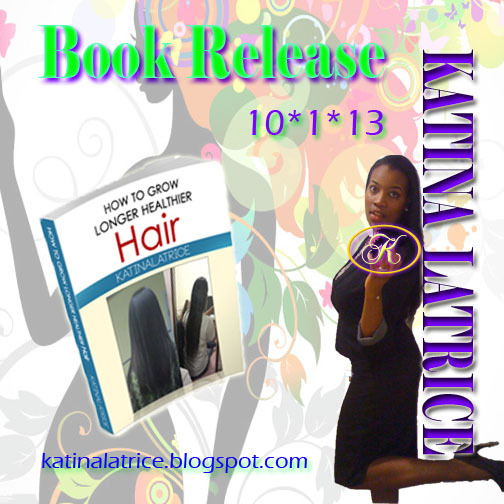 katinalatrice: Book Release Date Announcement!!!!!!!! Hi guys! I'm super excited to finally announce the date of my book release!!!!!! So as you can all tell from the picture above, the release date is set for October 1, 2013. All the I's have been dotted and all the T's crossed!!! I've gotten so many compliments on my hair and everyone always ask, how did you grow your hair so long and what do you use? Well ladies and gents, ALL my secrets including products, styles, and regimens will be included in the book. How great is that? You will have all the information you need at your finger tips. BONUS: Along with the book you will get a bonus video....YAH!!!! My face on camera? What more could you want? Lol just kidding...but the video is great...trust me. If you aren't already, make sure to follow my blog here, follow me on IG here, and follow me on twitter here. I update via IG faster than any other social site, so make sure to definitely follow me there. PLUS: The first 5 to purchase my book will get a little something special! Again, I'm so excited for the release of my first e-book...my first but definitely not my last!